The Slava is a component that connects the Liturgy of the Church and every day family life. It is an evident proof that pagan ignorance can be transformed into essential worship of the Body of Christ. The same transfiguration is supposed to happen to all of us who cut the Kolach and bless the kolivo within the context of the Divine Liturgy. Once again this year, the faithful of South Bend, IN got together for the Slava, Liturgy, Holy Communion and banquet. 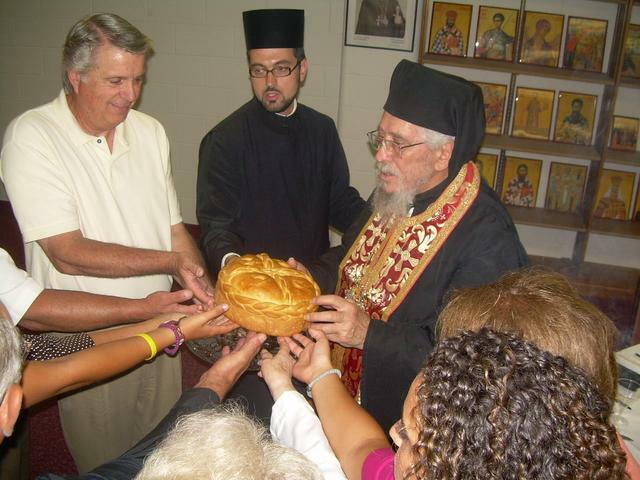 The proper day of Petrovdan at St. Peter and Paul Church was celebrated on Thursday, July 12. His Eminence Metropolitan Christopher was in attendance to celebrate the Hierarchical Divine Liturgy along with Fr. Mile Subotic, Deacon Damjan Bozic and Deacon Joshua Lolar, OCA. Kumovi Ron and Mara Balaban took part in the blessing and cutting of the Kolach along with Church Board members, heads of Kolo and Church/School. Thanks to Kuma Mara Balaban for providing the Koljivo and Kolach. “By doing so with our bishop-- a head of the visible Church, and the highest spiritual authority-- we connect the past, present and the future, and face Eternal Life. We become aware that we are not of this world, and that we are the citizens of the Kingdom of God. That is what the word “parish” means: aliens, a temporary place of rest, or something that is about to come”, as Fr. Mile reminded his parishioners in his Pastoral Letter. We processed three times around the Church (Litya) with parishioners, our Choir and flag bearers. His Eminence Christopher served the Pomen (memorial) for all deceased parishioners. Even though, for most people, it was a work-day, Fr. Mile was pleased with the church attendance. A delicious luncheon was served in the lower level and we thank Diane Bernhardt for organizing the luncheon and for those ladies that stayed to clean up. The Slava Banquet was held after Great Vespers the following Saturday, July 14th in our hall. Our Caterer served a delicious dinner and pastries were thankfully provided, as usual, by our own ladies. Del Bloss, 1st Vice President very ably served as master of ceremonies and introduced Kum Ron Balaban for this year’s Slava. Ron said he accepted this honor with gratitude and humility, however he said it belongs to many that came before him who worked hard for Sts. Peter and Paul Church and it is the memory of those he holds in his heart. “On behalf of our parish, Fr. Mile gave an inspirational speech and presented Kumovi with the Prologue written by St. Nikolai of Zicha and Ochrid along with a DVD on his life and history. The rest of the afternoon was spent in fellowship and dancing to the “Star Serenaders”.